It’s not often that an architect – even one like Kaplan Thompson Architects that has worked with rural setting before – gets a request to build an energy-efficient farm house that will allow the farm’s sheep to graze on the roof as well as the surrounding meadows. 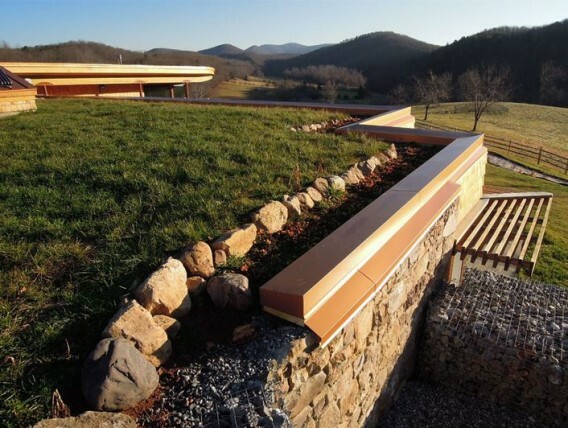 Kaplan Thompson never batted an eye, coming up with a design called the Earthship Farmstead, a net-zero-energy house that is embedded in a picturesque Virginia hillside. The structure not only earned German Passivhaus certification in February 2013 but is currently aiming for the rigorous LEED Platinum standards as well. The Earthship Farmhouse meets the strict Passivhaus standards and is aiming for LEED Platinum certification. Image via Kaplan Thompson Architects. The low green roof merges seamlessly into the hillside, allowing sheep to graze at will. Image via Kaplan Thompson Architects. True to their clients’ requests, the house includes a wide, green roof and native plantings that seamlessly flow into the adjacent fields and are easily accessed by the grazing sheep on the farm. Low Catawba stone walls mark the edges of the house and encircle an open-air stone patio. Diagram showing the various energy-efficient passive elements designed into the farmhouse. Image via Kaplan Thompson Architects. 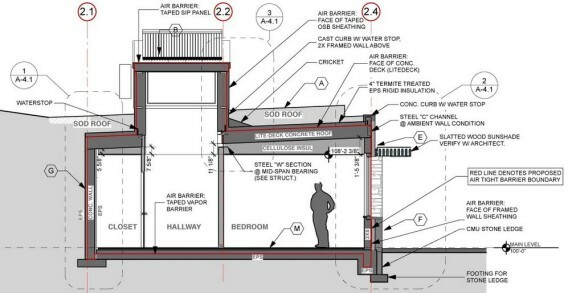 Under the Passivhaus standards, the house will use 90 percent less energy for heating than a typical house of its size. Heating and cooling is provided by a small, 1.5-ton heat pump system, made by Mitsubishi, which supplies fresh air continuously to the living spaces via a Zehnder energy recovery ventilator. According to Kaplan Thompson, the entire house can be comfortably heated during winter nights with the energy needed to run just two hairdryers at a total cost of roughly $500 per year. Part of this remarkable thermal performance is made possible by the use of R-30 insulation and between R-40- and R-60-rated roofs. Insulated doors and triple-glazed windows on the home are made by Makrowin. 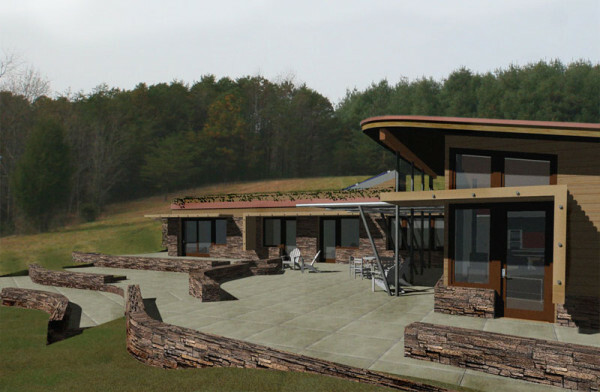 During sunny days, a 12 kW photovoltaic array mounted on the roof of the farm’s barn will generate more than enough of the energy the rest of the farm needs, making the Earthship Farmhouse a net exporter of electricity back to the rural Virginia power grid. Drinking water comes the old-fashioned way—via a well , using energy-sipping pumps and fixtures. Stormwater from the roof is also collected and stored in a large cistern for reuse on the landscaping.